Annie (Kristen Wiig) is going through a particularly tough time in her life. However, her best friend since childhood, Lillian (Maya Rudolph), is about to get married. Annie is her maid of honor, but when one of Lillian's other bridesmaids, Helen (Rose Byrne), claims Lillian to be her best friend, it creates a huge rivalry between the down-on-her-luck Annie and the wealthy socialite Helen in an effort to gain Lillian's favor. Paul Feig's "Bridesmaids" brings together an ensemble cast of comedic talent including SNL alumni Kristen Wiig, who also helped write the screenplay with Annie Mumolo, and Maya Rudolph, along with Melissa McCarthy, Ellie Kemper, Wendi McLendon-Covey, and Rose Byrne. Together, they create a funny, witty, somewhat raunchy comedy that received a lot of hype when it was first released. When we initially saw this film in 2011, we will admit it left us very underwhelmed. Now, five years later, upon revisiting "Bridesmaids," we were quite surprised how much we actually enjoyed it. As the years have ticked slowly by, our humor has changed to the point where the jokes we used to shrug off are now really damn funny, and we laughed quite a bit throughout the entire thing. Much of the humor offered is what Feig does best, the uncomfortable, awkward moments where we as the audience suffers from massive secondhand embarrassment for our characters. Other moments come from the screenplay's well written dialogue, a sprinkling of silly slapstick, and a hefty dose of straight-up toilet humor. This time around, almost all of it worked for us. We have sat here and tried to understand the state of mind we were in that hurt our enjoyment upon our first viewing of this film, and we're not actually sure why we didn't care for it the first time. We'd like to think that as people, we haven't changed too much, and BigJ and I have always appreciated a well executed toilet gag. 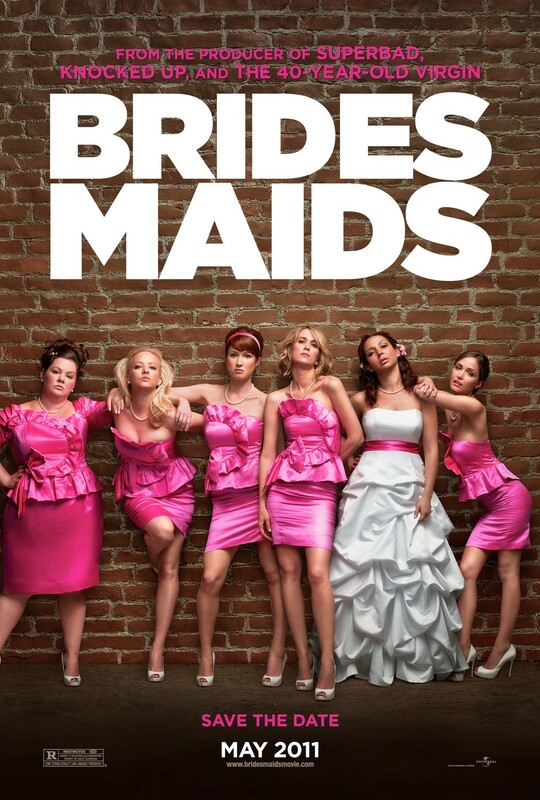 It has to be the amount of hype that built up "Bridesmaids" that let us down. At the time, we were not huge fans of anyone in the cast, so maybe it's our now-perpetual love for Kristen Wiig, or it is coming around to the idea of Maya Rudolph being a leading lady instead of a footnote in someone else's page. Or maybe, what we think is funny really is different now. It goes to show how subjective film is as a medium, and how your outlook or understanding of certain aspects can change throughout the years. One thing we've never had a problem with are the performances as each actress in the friend group brings a little something different to the table. Wiig's Annie is at a place where her life is crumbling all around her, Rudolph's Lillian is the oblivious friend just trying to get to her wedding day, McCarthy's Megan is the tag-along tomboy addition to the group, an afterthought because her brother is marrying Lillian, Kemper's Becca is the sweet and innocent married woman who might be a freak if she only let it out, McLendon-Covey's Rita is the married mom of boys who just wants a fun party to attend, and Byrne's Helen is the manipulative new friend who wants to make an impression and has the means and the money to do it. Each person does a great job making you believe their character type. Though many of the actors in the film are playing to their "type," that doesn't mean it's not wildly hilarious at times. Now, this is not a flaw-free movie. It feels like the comedy in the film is front-loaded and thins out into schmaltzy finale. It also begins to feel a bit overlong as Annie's life has hit so many speed bumps, you wonder what else the poor woman has to go through to get to her best friend's damn wedding. Sure, "Bridesmaids" might not be the funniest movie ever made, and it might not even be as funny as the hype promised, but it is worth a watch if you're a fan of even one of the women in it. It is a well written, funny comedy for and about women. It makes for a fun viewing experience that you don't have to and shouldn't take so seriously. One year ago, we were watching: "Fast & Furious"